CARACAS (Reuters) - Venezuela's top military envoy to the United States defected from the government of President Nicolas Maduro on Saturday, as the South American nation said the two countries had scaled back their diplomatic missions to skeleton staff. The diplomatic friction and defection was triggered by U.S. recognition of opposition leader Juan Guaido as Venezuela's interim president. Washington, Canada and most Latin American nations said Maduro's second-term election win was fraudulent. 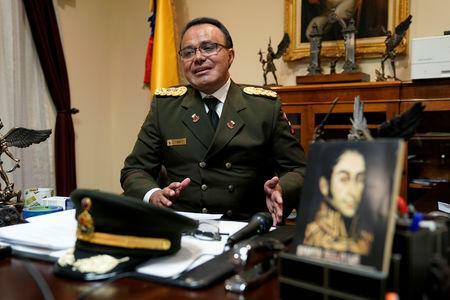 "Today I speak to the people of Venezuela, and especially to my brothers in the armed forces of the nation, to recognize President Juan Guaido as the only legitimate president," Colonel Jose Luis Silva said in a video recorded at the embassy in Washington, seated at a desk alongside the Venezuelan flag. Silva told Reuters in Washington that one consular official in Houston and one in another U.S. city also recognized Guaido, but that he was the only diplomat in Washington he knew of who had taken the step. Reuters was not able to independently confirm other defectors. "The top brass of the military and the executive branch are holding the armed forces hostage. There are many, many who are unhappy," Silva said. "My message to the armed forces is, 'Don't mistreat your people.' We were given arms to defend the sovereignty of our nation. They never, never trained us to say, 'This is for you to attack your people, to defend the current government in power." Guaido welcomed Silva in a message on Twitter and encouraged others to follow his example. In a tweet, Venezuela's Defense Ministry called Silva a coward, posting a picture of him emblazoned with the word "traitor" across it in red capital letters. U.S. National Security Council spokesman Garrett Marquis called the defection an example of the principle "that the role of the military is to protect constitutional order, not to sustain dictators and repress its own people. Encourage others to do the same." A 72-hour deadline issued by Maduro for U.S. embassy personnel to leave Caracas expired on Saturday, after the embattled socialist leader broke off bilateral relations on Wednesday. Some U.S. embassy staff left Caracas on Friday, and Venezuela was withdrawing staff from Washington on Saturday, Venezuela's foreign ministry said in a statement. However, Maduro softened his demand that all U.S. embassy staff withdraw by Saturday. Instead, the two countries will seek an agreement to replace the embassies with "Interest Offices" in their respective capitals within 30 days, the statement said. For decades, diplomacy between Cuba and the United States was represented by an interest section. If the two sides fail to reach an agreement, the remaining diplomatic staff will have to leave and the missions will close. (We would) "maintain an Interests Office, with minimum personnel, and office of representation of interests as functioned in Cuba. That is true diplomacy," Maduro said in a live broadcast with Venezuelan youth. "We don't want to be a North American colony," he sang during the broadcast, during which he also pounded conga drums. For now, the remaining staff can only carry out their activities within the diplomatic missions, the statement said. The U.S. State Department did not immediately respond to a request for comment on the status of the embassy in Caracas.